On February 23, members of the cancer community gathered at the Allen County War Memorial Coliseum for the 10th Annual Spring Auction. Our “Game Time” themed Design on Life event resulted in an evening of delicious food, live entertainment and fabulous silent and live auction items. New this year was the addition of mobile bidding technology which allowed guests to bid via smartphone, text or using a concierge host. Guests scored exciting auction items including a majestic Alaskan cruise, original artwork, spa packages, an amethyst and diamond necklace, autographed memorabilia, custom culinary experiences and more! The food, by Executive Chef Christopher Zimmerman, was served at action stations and reflected the sports theme. Just a sampling of the evening’s food offerings include a Kentucky Derby station serving bourbon BBQ short rib sliders and apple jalapeno slaw on the side as well as a Derby cheese hat made with a wheel of brie topped with boursin and fresh herbs. A quick trip to Wimbledon featured a variety flavorful tea sandwiches and hot teas. The NFL station offered up some Cajun flavor to compliment the Super Bowl being hosted in New Orleans. Oyster Po Boys with fried green tomatoes were dished up alongside quinoa jambalaya. Along the same theme, bananas foster with vanilla ice cream was flambéed as just one of the mouth-watering desserts. Most importantly, the event brought together people throughout the Northeast Indiana cancer community to help raise money and awareness for our important mission. We extend our heartfelt thanks to our sponsors and volunteers whose support made this occasion such a success! We could not do this important work without your patronage. 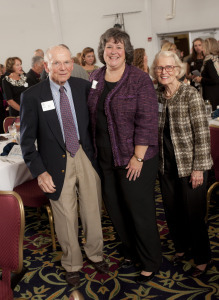 “It is such an honor to recognize Jeanne and her long-standing commitment to the organization this evening. Like many volunteers, Jeanne became aware of Cancer Services, then the Allen County Cancer Society, when cancer personally touched her life. She began volunteering in the early 1970’s by delivering bandages and bed pads made by volunteers to cancer patients in the community. Her daughter Lisa remembers as a child accompanying her mother on these trips to help others. Jeanne is a woman of strong faith who deeply values friendships, possesses a sincere desire to serve others and is a blessed with a remarkable energy level. She is the kind of friend we all need and hope for in our lives and Jeanne’s gift of friendship crosses multiple generations. When I first met Jeanne she was clear and passionate when telling me how important she believed it was for our community to understand that Cancer Services is an entirely local organization. For many years she has made it a priority to spread the word about our mission to help local people here in our community. In all the things she has done and continues to do, she never seeks personal recognition. She volunteers and serves because she values people. At Cancer Services we have staff members who serve as personal advocates for families. Jeanne is an advocate for the mission of providing encouragement and practical help. Another volunteer at the organization has coined the phrase, “having a heart for cancer.” Jeanne truly has a heart for cancer and coupled with her remarkable energy and desire to serve others has become a champion of hope for many. It is fitting that as she celebrates a milestone birthday this fall we celebrate her gifts of compassion and service to others. I’m always having new experiences and meeting people who have a heart to help others! On November 20, and again on January 16, I attended Columbia City High School Wrestling meets. The team decided to wrestle for a cause with proceeds being given to our organization. Everyone on the team, as well as coaches and managers, chose a cancer to represent and wore a shirt at both meets designating their choice. Between November 20 and January 16, a silent auction was held for these shirts, as well as several other fundraising activities. I was at both meets with our cancer ribbons, and once again people were amazed at the variety of cancers represented. On January 16th I was honored to be able to thank the team and all the supporters in the stands for their generosity. A total of $730 was donated ! 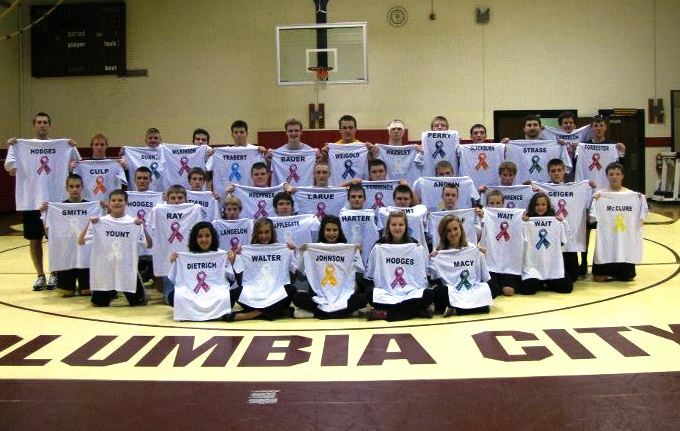 Thank you Columbia City High School Eagle Wrestlers!! 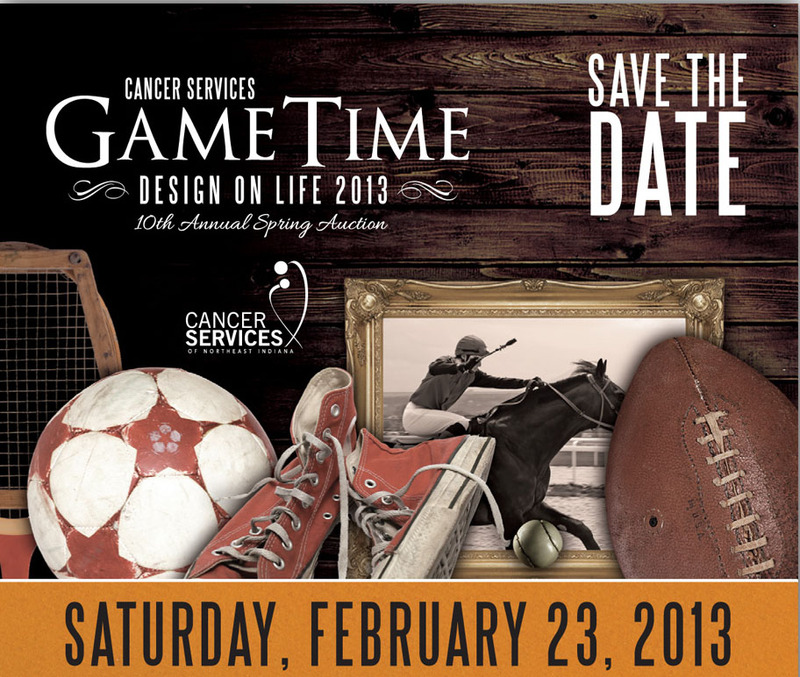 Tickets are now on sale for Cancer Services of Northeast Indiana’s 10th Annual Design on Life fundraiser, which takes place on Saturday, February 23, 2013 at the Allen County War Memorial Coliseum. Get yours online today or call Betsy at (260) 484-9560. Event attendees will be treated to a taste of Wimbledon, the Kentucky Derby, World Cup, PGA and the NFL at this year’s “Game Time” themed event. Delicious hors d’oeuvres prepared and beautifully presented by Executive Chef Christopher Zimmerman and entertainment will be part of the “Game Time” action. The highlight of the evening remains our silent and live auctions featuring vacations, jewelry, sports packages, spa treatments, art, and more. 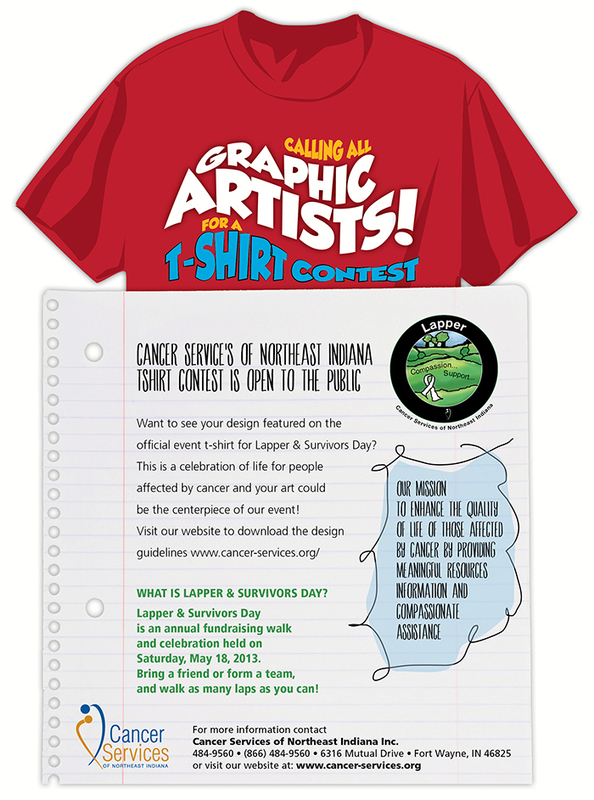 Proceeds will benefit programs supporting individuals in our community who are affected by cancer. Each year Cancer Services helps over 2,500 individuals and their families by providing financial assistance, medical supplies and equipment, and emotional support. This was said by an East Noble Swim Team member while touring our building, and it brought a smile to my face. We strive to provide a pleasant, uplifting environment for our clients, and to hear a young person voice this told me we are succeeding. On January 25, representatives from the East Noble Swim Team visited to present the agency with a check and to take a tour of the facility so they would better understand what their donation provides for people with cancer. 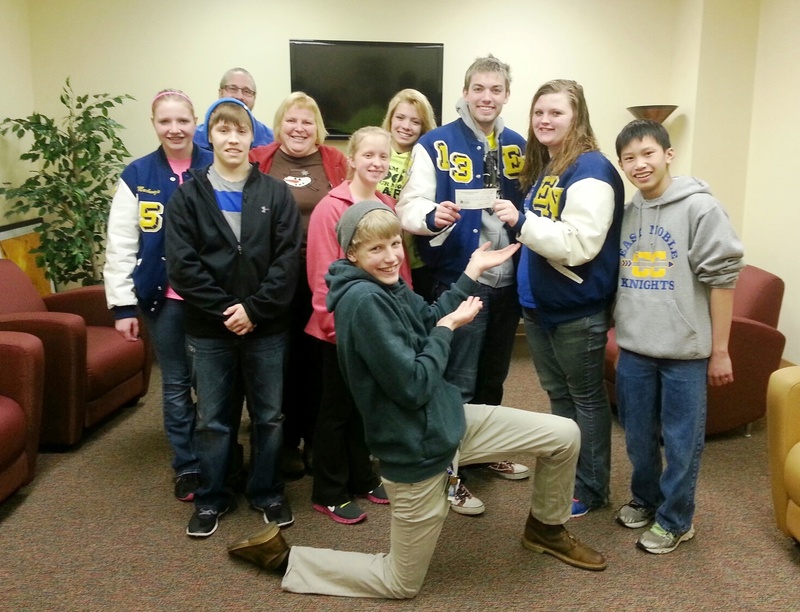 $825.30 was given to Cancer Services! Thank you East Noble Swim Team! About 2.4 million Hoosiers or 2 in 5 people now living in Indiana will eventually develop cancer. What impact does that have on our state? 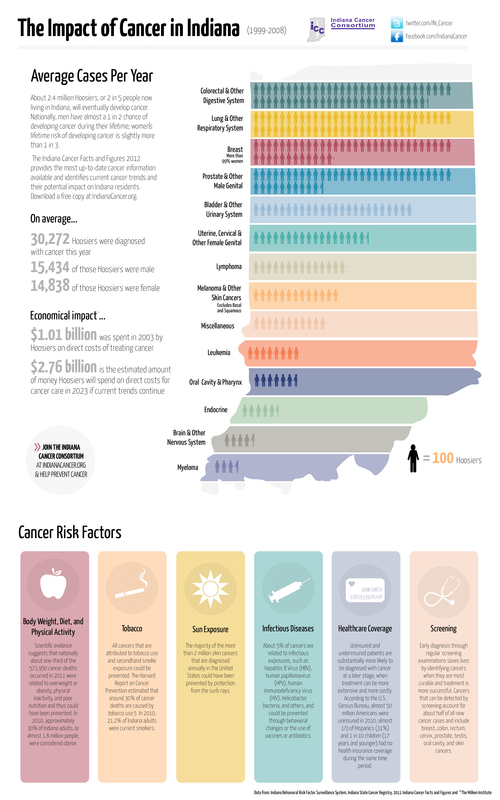 The Indiana Cancer Consortium put this infographic together to help answer that question. Last Thursday, we hosted our first Drumming Circle and had so much fun. A small group joined us and learned the joy in creating noise in order to relieve stress and create connections. Gail Hamm, program director, describes the experience as a fun way to let go of stress. Through drumming, people may express emotions, reconnect with their inner child, and feel a greater sense of purpose as their noise becomes a part of a larger symphony within the group. You can join us at our next Drumming Circle, which will take place on Thursday, February 28, from 7-8 PM. No experience is necessary and all instruments are provided. Drumming Circle is open to the community. For more information, call Tina at (260) 484-9560. New Programs in 2013! Join us! We are excited to introduce two new programs for 2013! Join us the 4th Thursday of every month from 7 to 8 PM, for Drumming Circle. Come and experience the freedom and joy of play, with no pressure. Express yourself! Instruments will be provided. No musical experience necessary. Both programs are open to the community. To sign up for these programs, please call (260) 484-9560 or 866-484-9560. 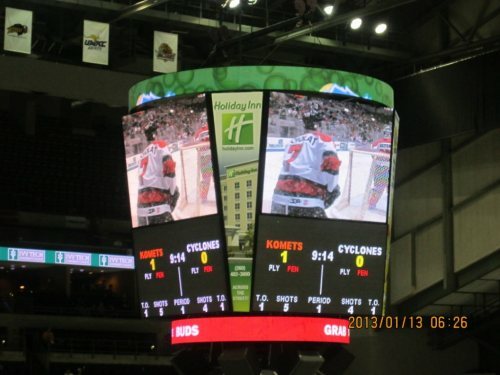 On Sunday, eleven of our client families enjoyed a Komets game together. We are often asked about our services for children with cancer. It is our mission to support the entire family on this journey. Bringing the families together, provides them with a support system full of people who truly understand what they are going through. It also gives the kids a chance to support each other. Thank you Fort Wayne Komets for hosting a meaningful event for our clients.